The entire Scooby-Doo! theme has caught me by surprise. When I first saw them on the shelves at my local Toys "R" Us I was happy to see the Scooby-Doo franchise seemingly alive and well and in the consciousness of a younger generation, but I had little interest in acquiring any of the sets myself. Then, as usually is the case, my daughters started watching the Scooby-Doo animated series reboot from 2010 on Netflix, and the love I had for Scooby-Doo when I was a child once again began to surface. I should also mention that my wife thought that these sets were interesting too and gave me the go ahead to pick some up. Needless today, whenever my wife gives the green light to purchase more LEGO...I purchase more LEGO. All that being said, this theme has caught me by surprise because it's actually turned out to be one of my favorite LEGO themes currently available. In fact, I think it's one of the best executed themes that LEGO, perhaps, has ever done. It hits all of the typical price points, is packed with great play-features, includes wonderful minifigures which represent a treasured piece of pop-culture, and each set in theme is fun to build and has lots of display value. 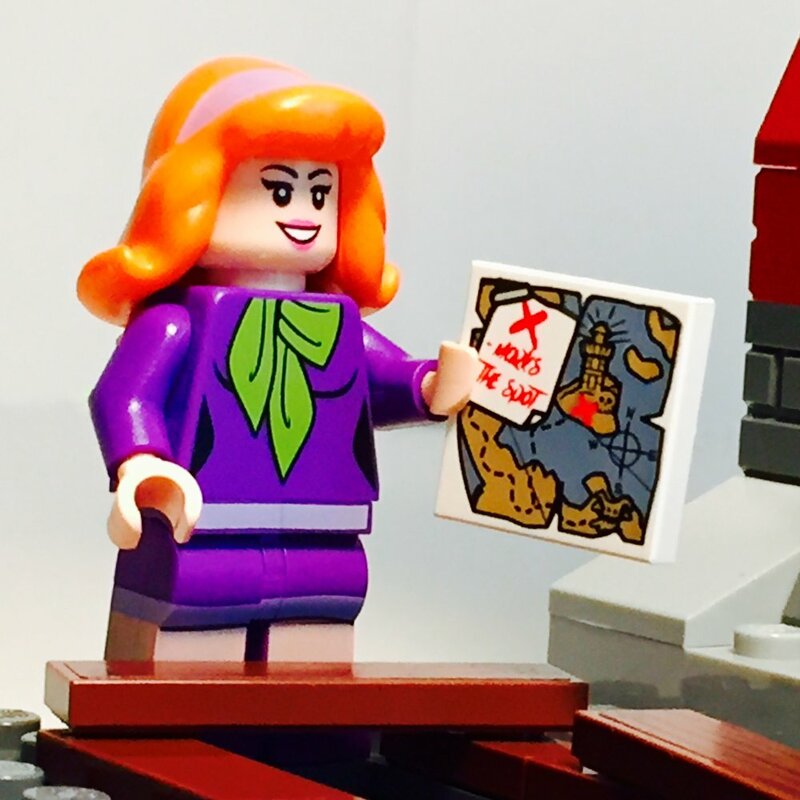 It's not often [really not often] that a licensed LEGO theme based off of a children's cartoon series achieves such goals and is as well executed as Scooby-Doo! 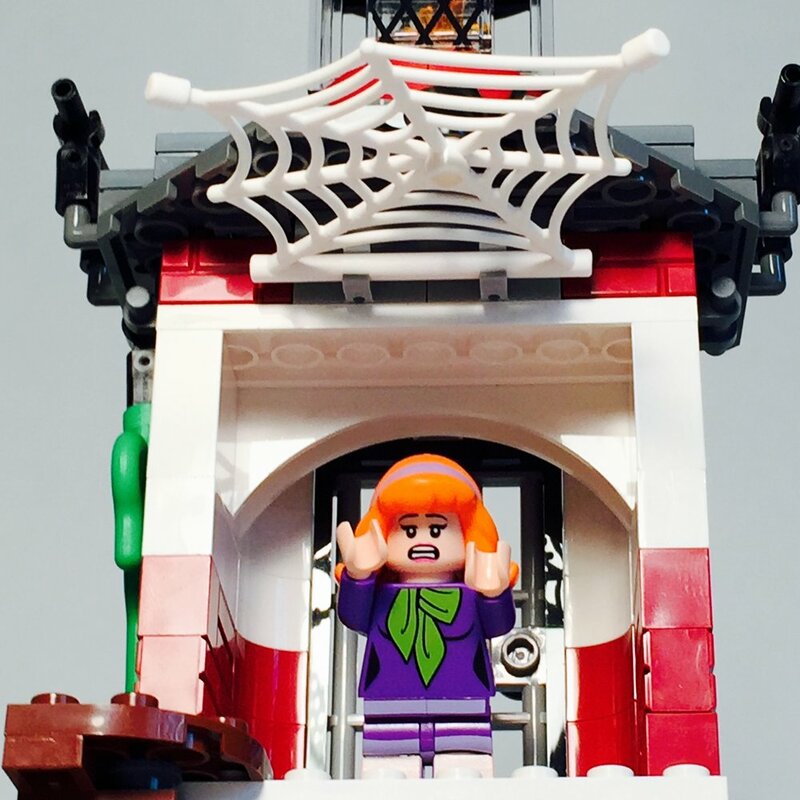 If you're on the fence about the Scooby-Doo theme, stop contemplating and go out and buy these sets. They're great for anyone's collection, and the set we're focusing on in this review, Haunted Lighthouse, is absolutely no exception. 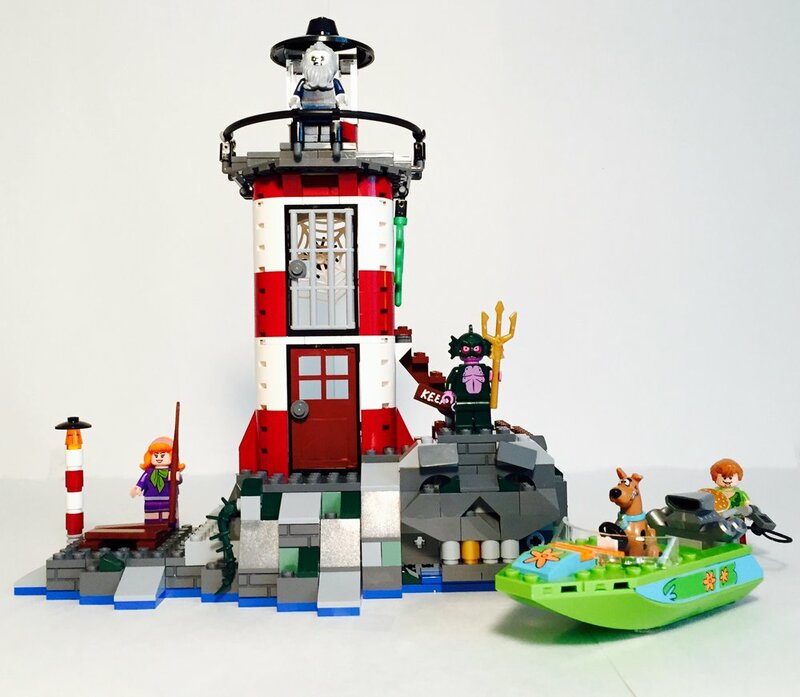 The brick-built rock skull, uneven, multi-colored shoreline terrain, and brightly colored lighthouse tower complete with the occasional exposed brick, make the Haunted Lighthouse, in my opinion, the most displayable model of all the Scooby-Doo! sets. 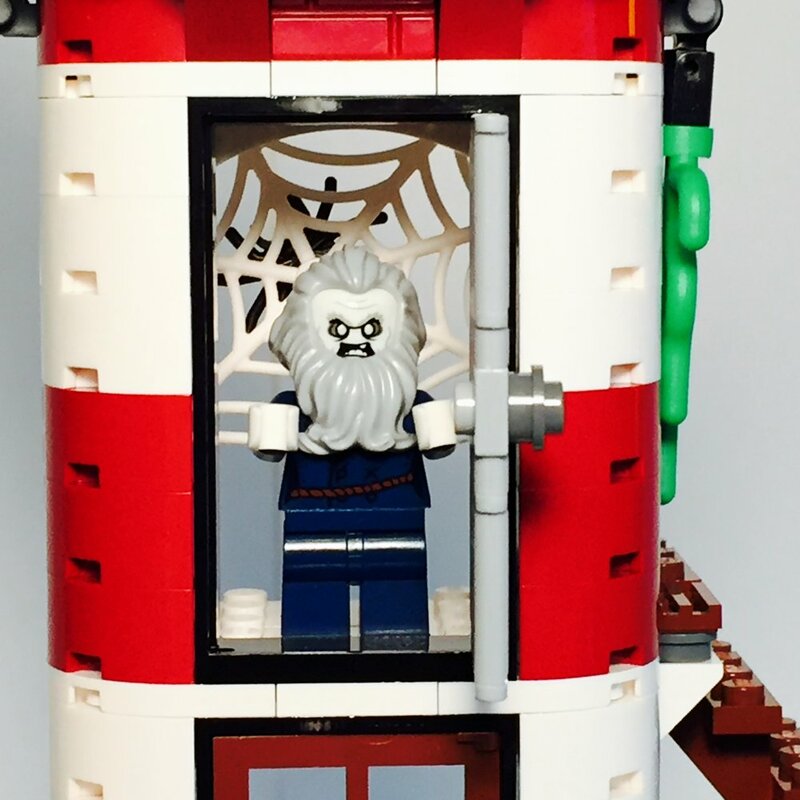 Haunted Lighthouse is a great example of a set designed so well that you don't miss the lack of a baseplate, which is certainly a common complaint these days. The bottom "layer" of the model is blue which allows you to imagine the water just crashing up on the shore around the lighthouse. 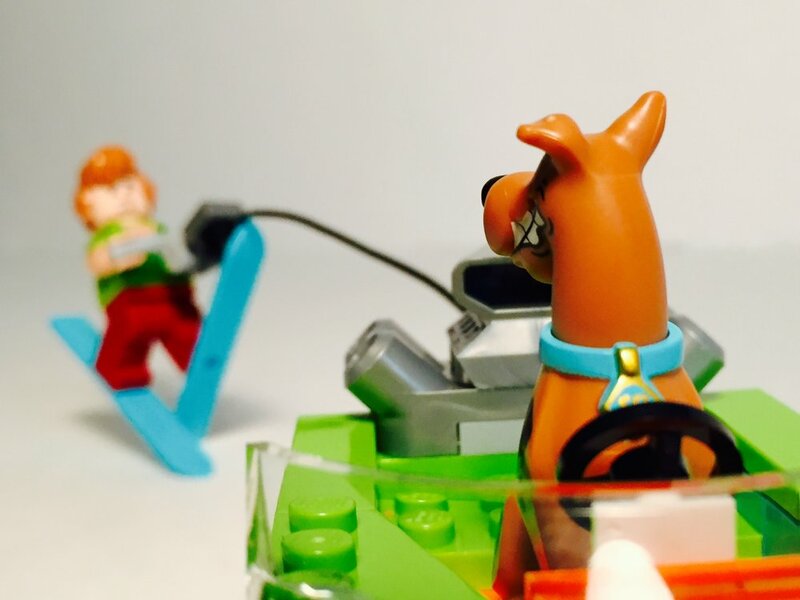 The inclusion of the Mystery Gang speedboat also helps to create the illusion that this set is larger than it really is, as you can have your minifigures drive the boat far away from the model before deciding to head back to the lighthouse - an act of imagination which might not occur had this set included a baseplate. The set is loosely based on episode 1, season 3 of the What's New, Scooby-Doo? television series which aired from 2002-2006 titled "Fright House of a Lighthouse." 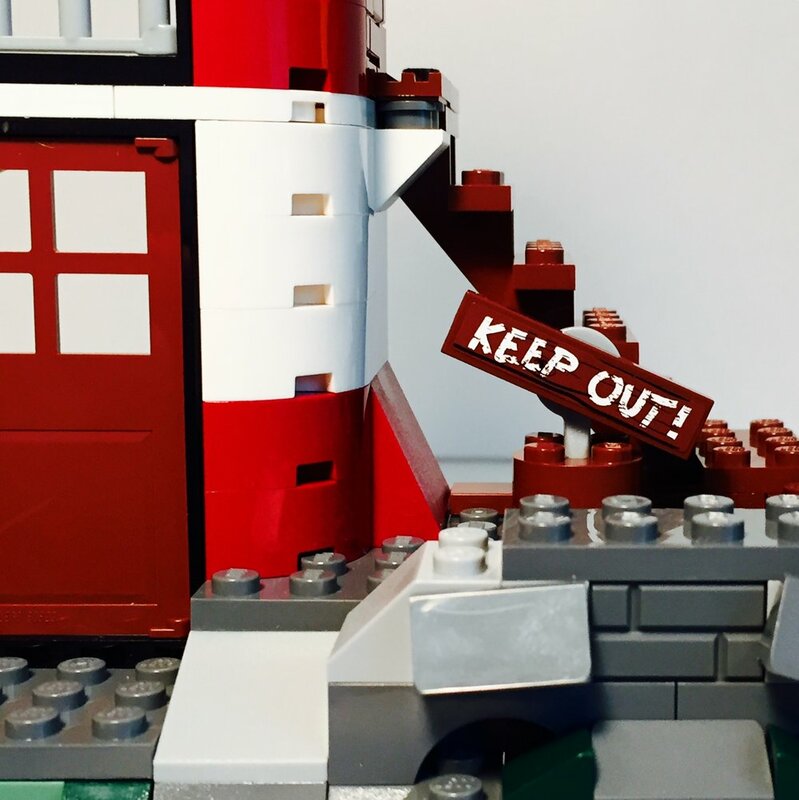 The lighthouse itself is built in the traditional LEGO dollhouse style with a detailed front, including a spot for hidden treasure map, a Keep Out! sign, and front entrance doors, and an open back to allow for the inclusion of interior detail and easy access for play. 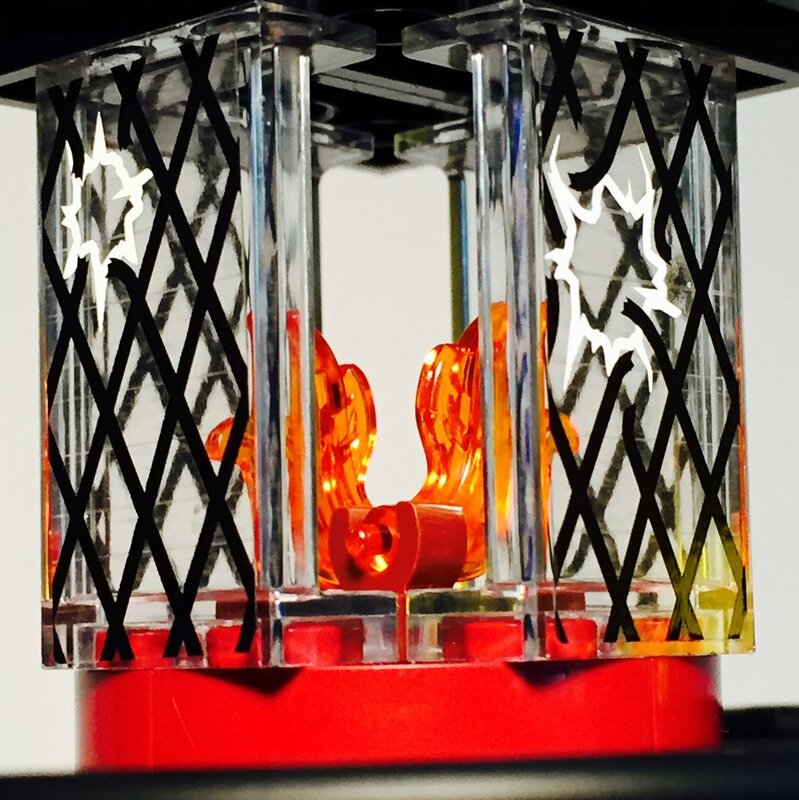 The top of the model contains a great build for the light which includes two translucent orange flame pieces meant to represent the source of the light and four windows along the sides of the flames which incase the light. 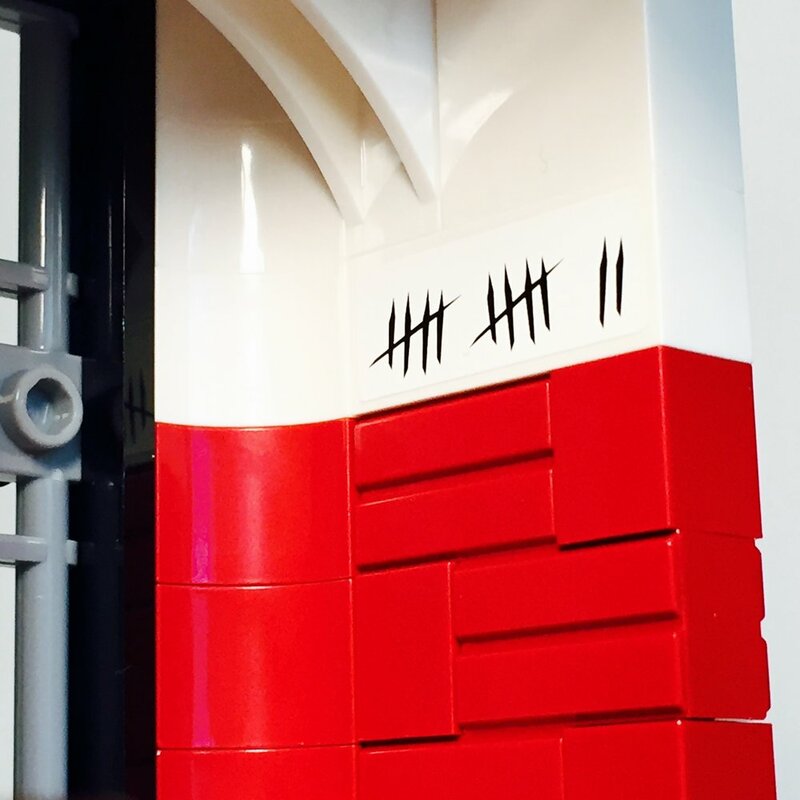 The set includes a sticker for each window piece which helps to add detail, but also helps to stay true to the lighthouse as it is seen in the television show. 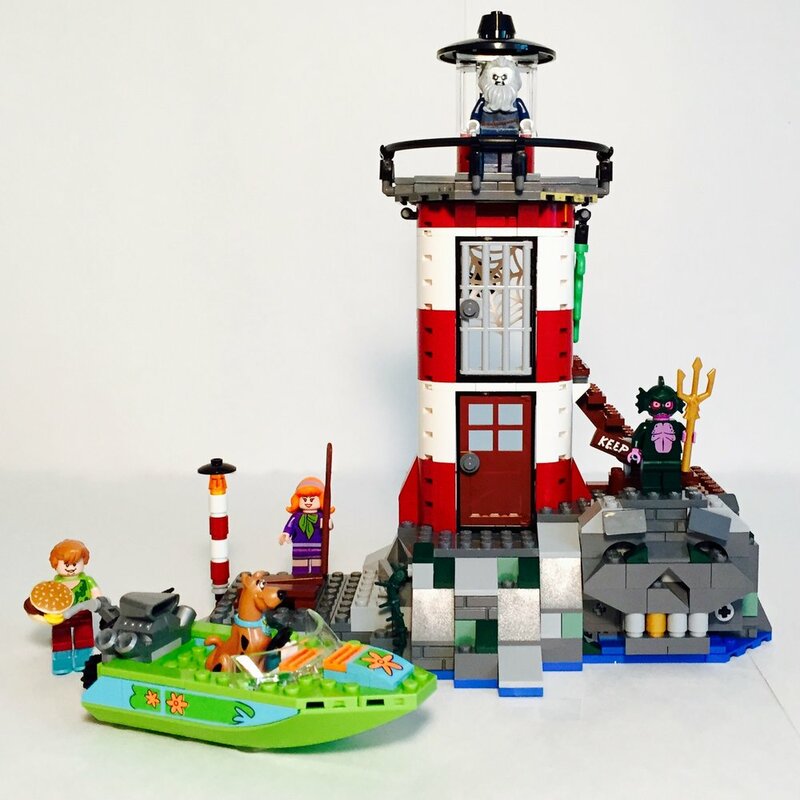 Image displaying the top of the lighthouse from the What's New Scooby-Doo? episode "Fright House of a Lighthouse." The second floor of the lighthouse or the room just below the lighthouse's light structure is the "spider cell." It's a place to for either the Mystery Gang to lock up the Swamp Monster and the spooky lighthouse keeper, known as the Creepy Keeper, or vice versa. The spookiest part is this room is made inescapable as a result of a large [and, apparently, very strong] spider web complete with large black spider which has blocked the wall opposite the door! This room contains, perhaps, one of my favorite uses of stickers in any LEGO set. If you look closely, you'll notice that whomever has been locked in this room has been there for at least 12 days...zoinks! The first floor of the lighthouse is a quant little kitchen area with just enough room for a small stove. Apparently, the Creepy Keeper is quite the foodie [or maybe it's the Swamp Monster]. 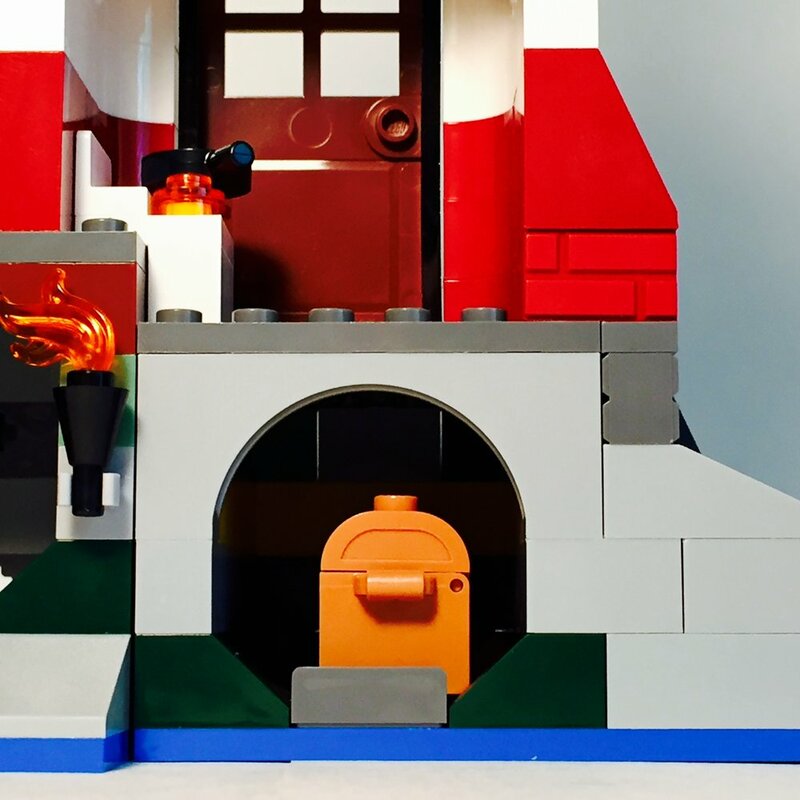 Nevertheless, the stove build succeeds in establishing a purpose for this tiny room and does so with only a few bricks. All of the rooms and the exterior landscape of the model has plenty of room to place your minifigures. Even the small rooms inside the lighthouse can easily display up to 2 characters at a time. This makes for a great play space for our Mystery Gang. That's plenty of room to catch the crooks, despite where they might be hiding. Starting from the bottom up, this set [as most of the Scooby-Doo! 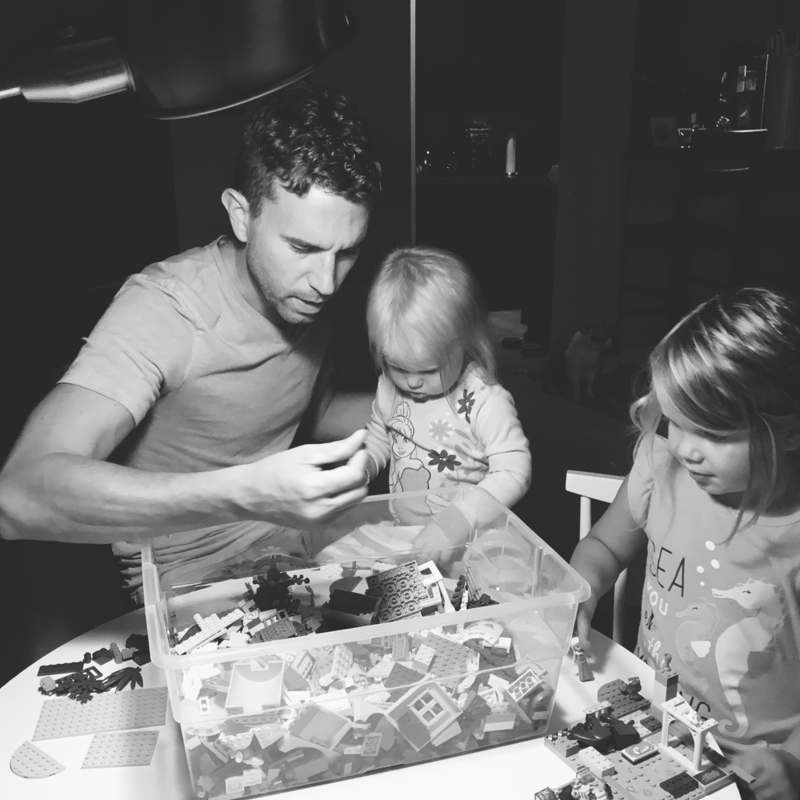 sets tend to be] is packed with play features. First, the basement area. This is, perhaps, the most interesting part of the whole set, as it's packed with play features and contains the sets biggest reveal. If it's treasure you've been seeking, than the small cave located just beneath the lighthouse's kitchen is where you want to go. This tiny crevice contains a treasure chest, complete with silver goblet and two gems [I hear the value of gems is currently falling, so you may want to unload those quickly. Maybe Fred's parents would be interested?}. 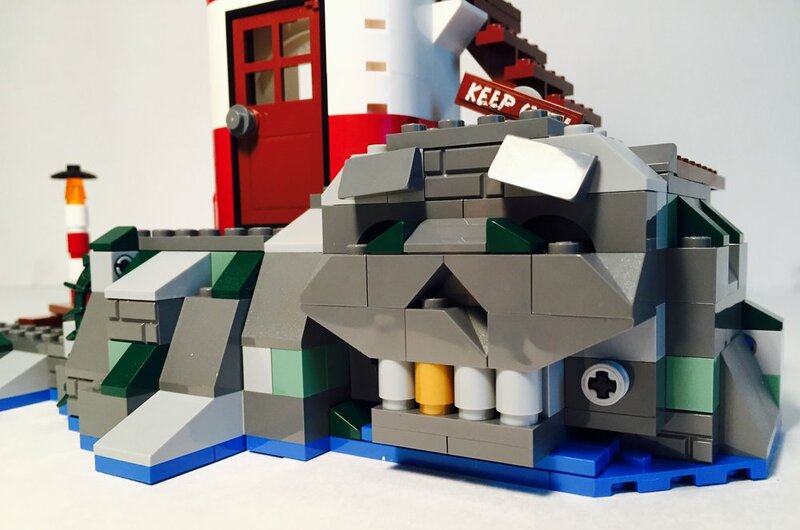 The question remains - how are the minifigures expected to access this lower level of the lighthouse? This leads us to one of the coolest play features of the set. You may have noticed in the above picture that the back of the model includes a large knob and gear system with a big yellow arrow [sticker] on the knob. In order for your minifigures to access this area from the front, all you have to do is turn this knob from left to right. The gear mechanism is connected to the skull build on the front of the model. 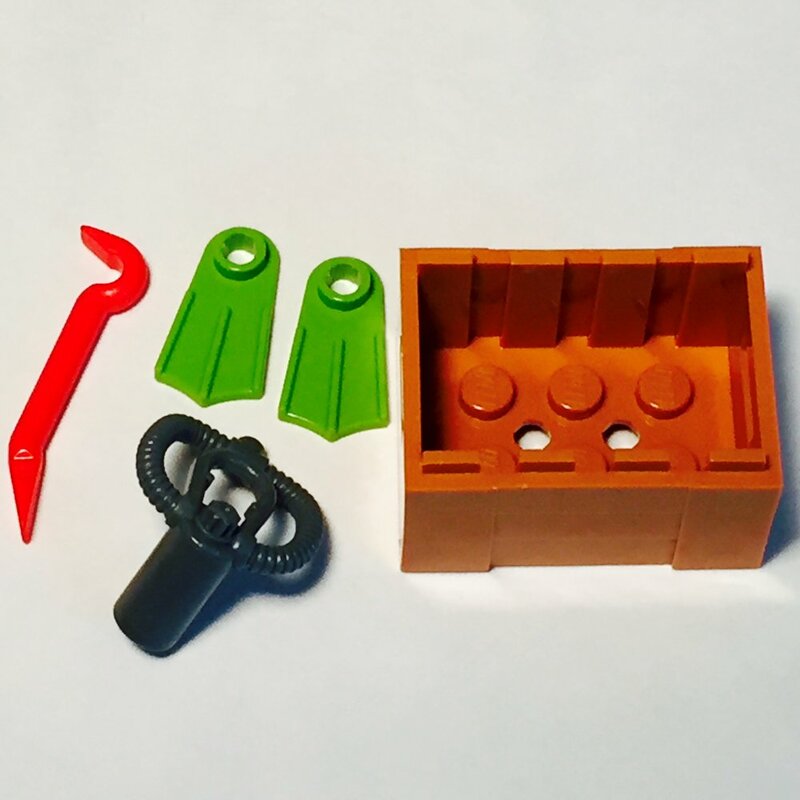 Turning the knob will rotate the entire skull build from upward right to left, revealing the basement area of the lighthouse and providing for an easy way for you and your minifigures to access this area from the front of the model. This is a great example of a fantastic play feature which wasn't necessary for LEGO to include. This set would have worked and would have been a fun, imaginative set without it. 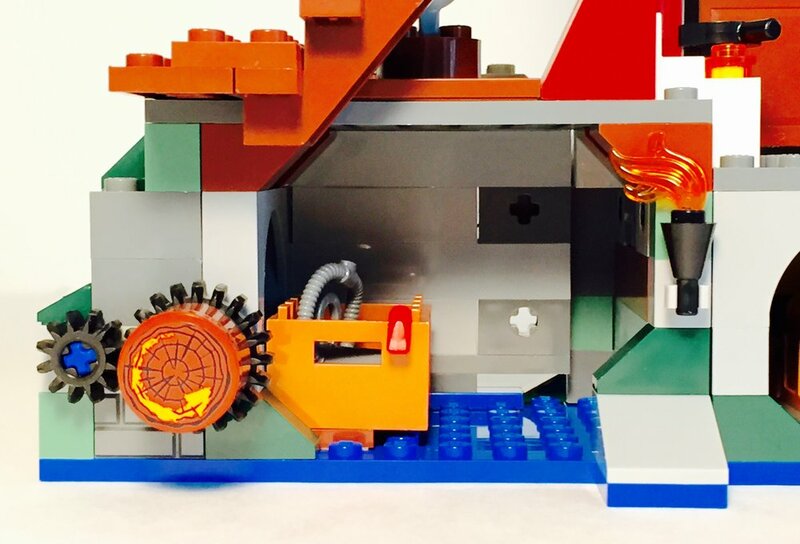 The inclusion of such a feature shows the willingness and drive of the designer to push their creativity farther than necessary in order to produce a great set that kids [and adults] will love. Moving out of the basement area and onto the main first level of the model there is a play feature which has found its way into each of the Scooby-Doo! sets in this wave - a hidden treasure map. Once your speedboat docks near the red and white lamp post and the Mystery Gang tumbles out of the boat to start investigating the lighthouse, the first thing they'll notice is a couple of loose wooden boards seemingly hiding something on the shore. If you pull these 2x4 tiles with sticker-details aside, you'll find that these boards are in fact hiding the all-important treasure map for this adventure! Go, Daphne! Moving up the model, we have the aforementioned "spider cell." I mentioned above that this area can act as cell or prison area for either the Mystery Gang or the antagonists of this set, but there is an additional play feature included here. It's a simple one, but worth mentioning. 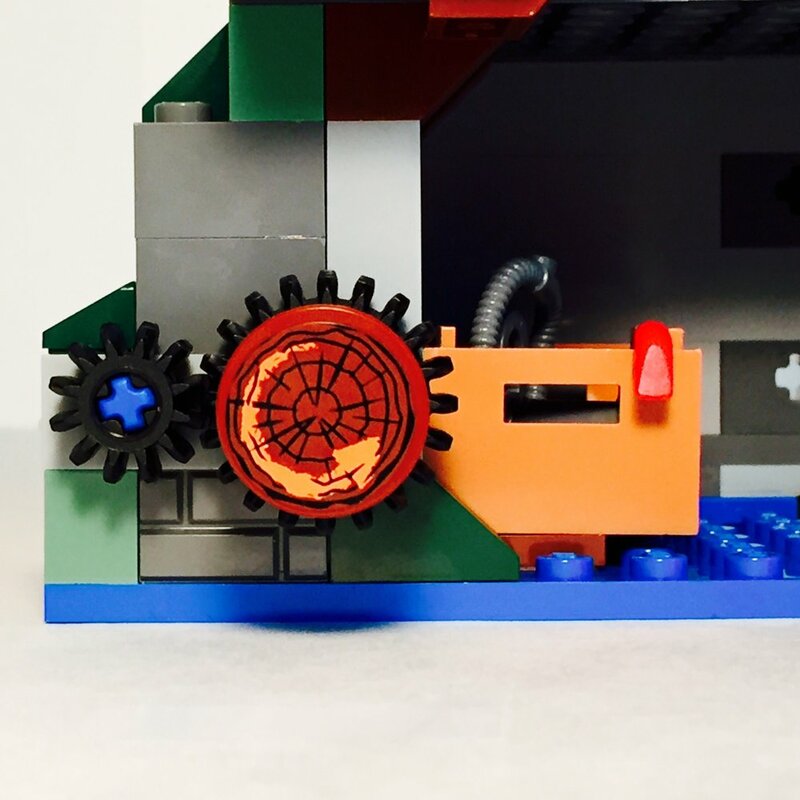 The large spider web which acts as the "prison bars" opposite the door is hinged to the model which allows you to use the spider web piece as door way - opening and closing it to allow for easy access or to ensure that your minifigures are not able to get out. 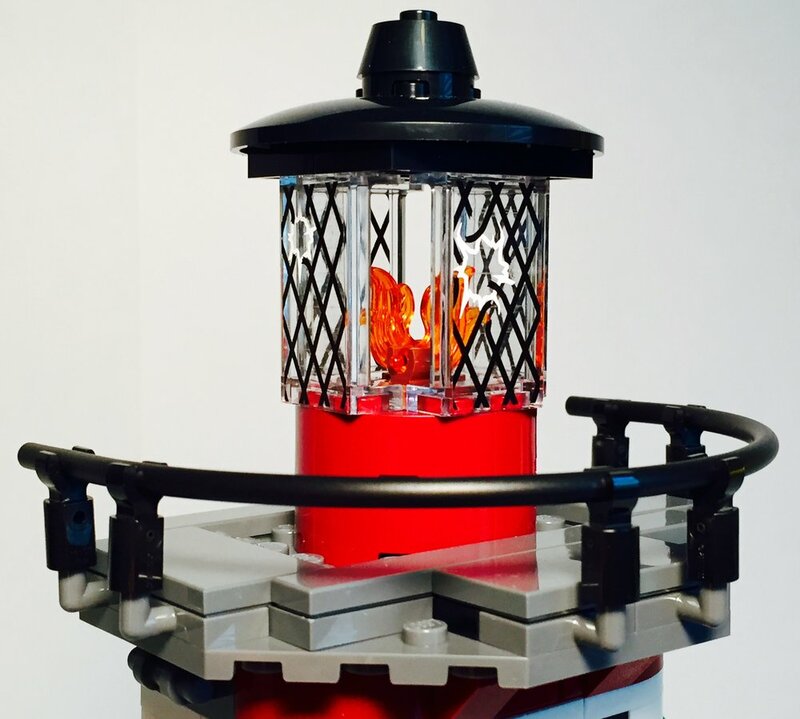 Just when you thought that LEGO could not possibly pack another play feature into this model, it turns out there is another hidden feature, and it can be found - underneath the lighthouse's light. What?! That's crazy. You can't be serious! Let's check it out. The entire light structure is actually hinged via a modified plate, allowing the entire structure to lift up to reveal some extra storage. It's a neat play feature, but there's really nothing important stored....Wait a minute. Is that? Is that A KEY? There it is! The key to the treasure chest! [Cheers and applause...suspense commences...whew]. 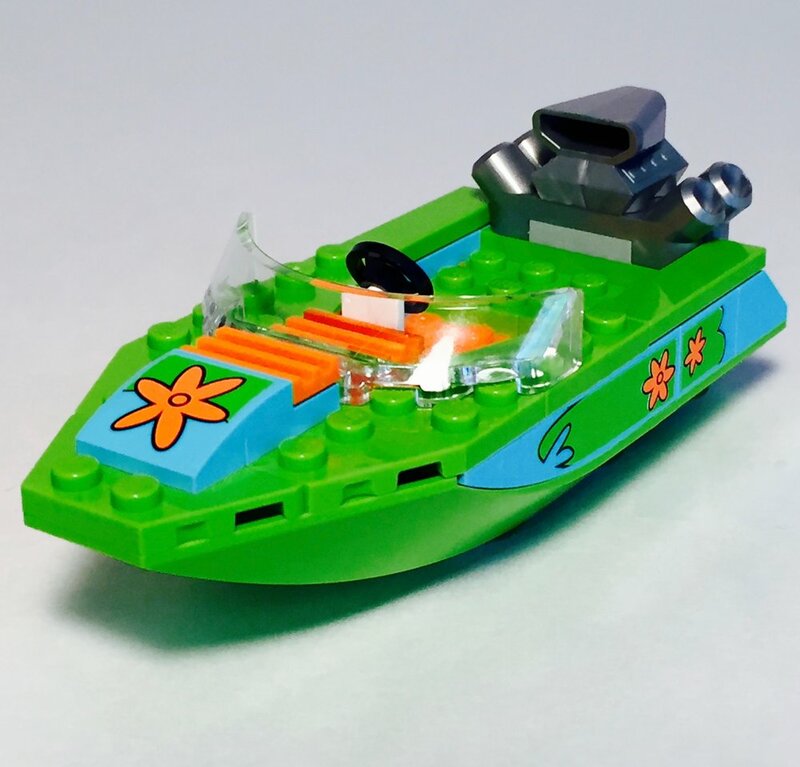 The last play feature I would like to highlight is the Mystery Gang speedboat. The build of the boat is very sleek and sturdy for such a small boat. 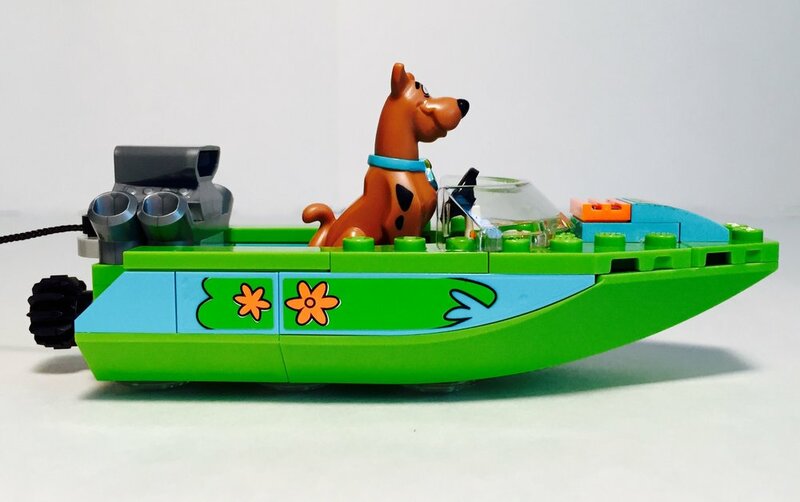 As you probably assumed [and as is the case with all of the Mystery Gang logos and graphics in this theme], the graphics on the speedboat are accomplished via stickers. 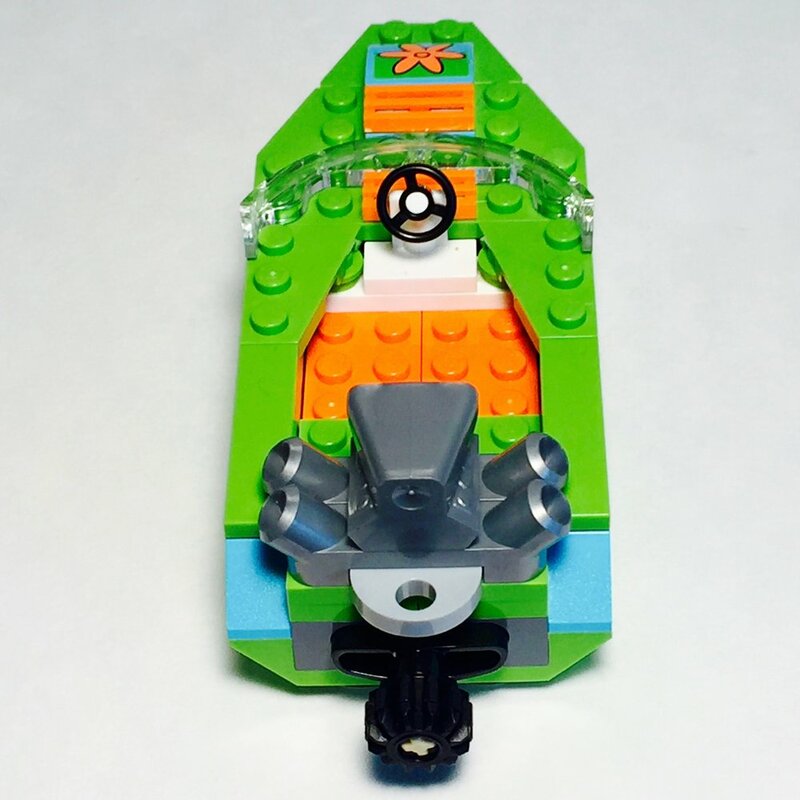 The stickers on this build are fairly easy to apply, so they don't decrease the overall build-quality of the boat. The inclusion of a rope piece and handlebar quickly turns this boat into a play feature which can provide hours of fun on its own [as the number of ridiculous poses I photographed for this review demonstrates]. Image of the Creepy Keeper from the What's New, Scooby-Doo? 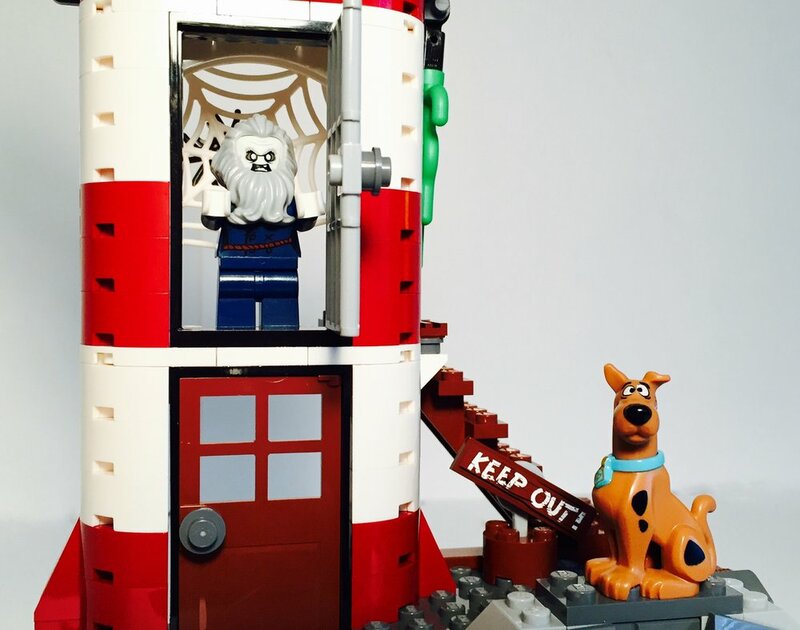 episode "Fright House of a Lighthouse"
The Haunted Lighthouse set includes a total of 4 minifigures along with a version of Scooby-Doo exclusive to this set. The other Mystery Gang figures included are Shaggy [with an exclusive aquatic-themed torso print - complete with sea weed and starfish], and Daphne. The antagonists included are the Lighthouse "Creepy" Keeper who is revealed to be Verona Dempsey and the Swamp Monster who is revealed to be Mr. Brown. The Lighthouse Keeper/Verona Dempsey character is pulled straight from the same episode of What's New, Scooby-Doo! from which this set is based ["Fright House of a Lighthouse"]. 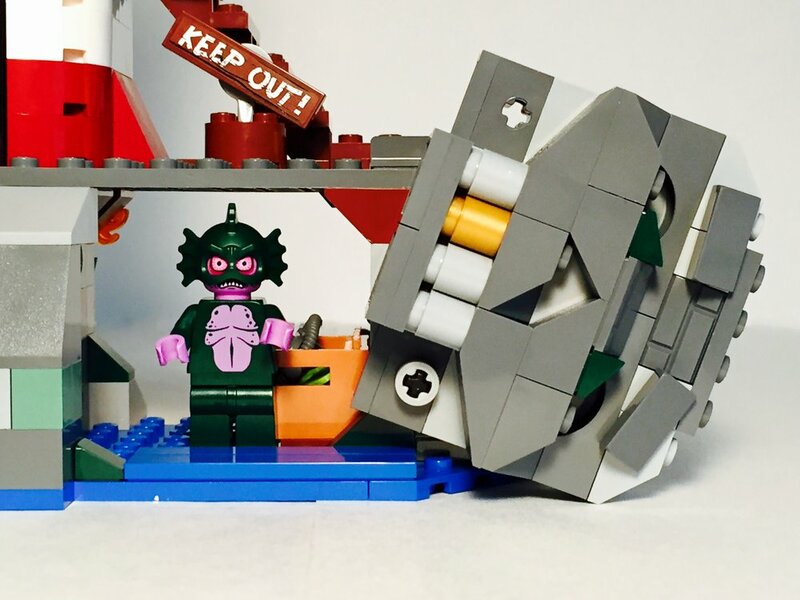 I do wish they could have incorporated the hat worn by the Creepy Keeper in the episode, but otherwise the figure is a great LEGO representation of the in-universe version of the Keeper. Additionally, the headpiece of the Creepy Keeper/Verona Dempsey minifigure does glow in the dark. The Swamp Monster/Mr. Brown character, on the other hand, seems to be purely a creation of LEGO's. No character of this name or names appears in Scooby-Doo canon. I understand why LEGO went this route. 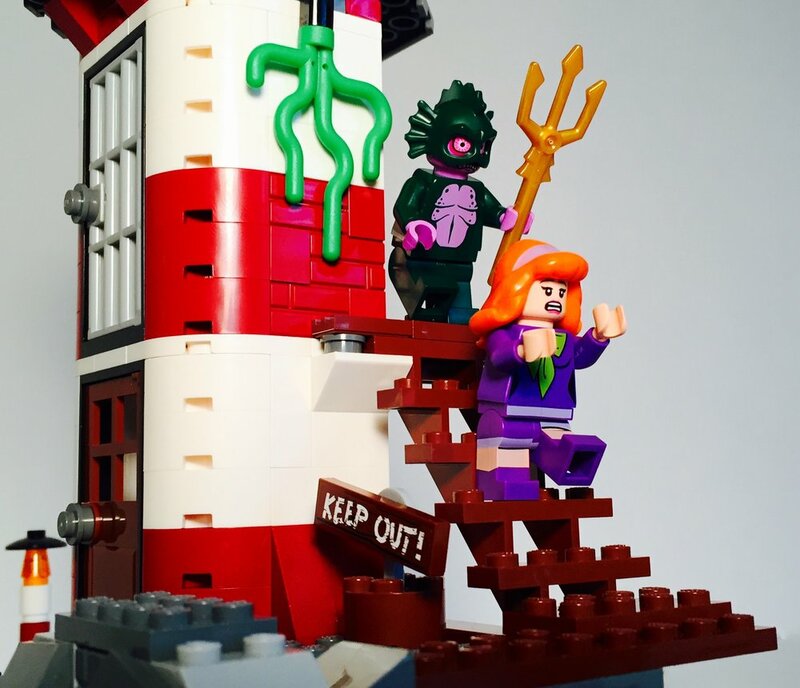 They clearly wanted a second antagonist that made sense in an aquatic/lighthouse theme so they created a Swamp character, but it seems odd - considering the hundreds of Scooby-Doo antagonists created throughout the many years and iterations of the show - that LEGO couldn't bring one of these hundreds of characters into this set, as opposed to creating new characters which fall outside of Scooby-Doo canon. It's a small nit-pick, I know, and the children purchasing and enjoying this set will surely not care, but staying true to the universe of a franchise is one of LEGO's strong points, so the inclusion of a LEGO-created character comes off as an odd choice to make. All that being said, the Swamp Monster figure itself is a great minifigure and certainly enhances the overall play of the set. All four of the figures have prints on the back of their torsos. I especially enjoy that Shaggy's sea weed print is brought around to the back as well [Seriously, what has he been up to?]. 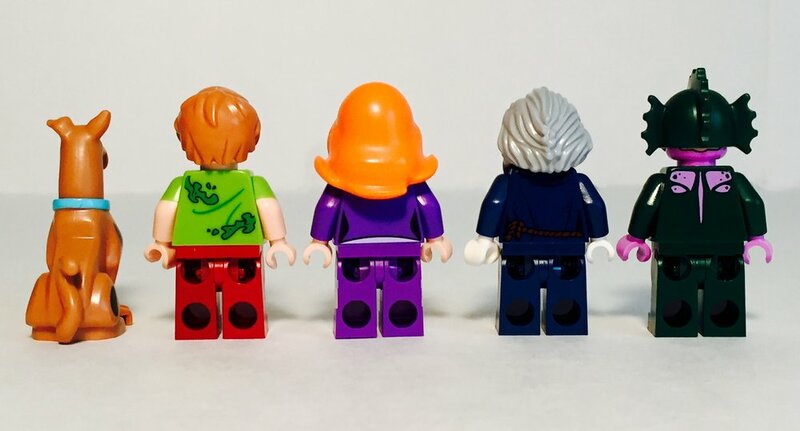 All four of the included minifigures have alternate faces. The Creepy Keeper and the Swamp Monsters alternate faces reveal their true identities - Verona Dempsey and Mr. Brown. Even ol' Scoobs gets an additional expression on the left side of his face. He's looking like he just saw a Swamp Monster! Here's a look at the villains head pieces with the hair on the Creepy Keeper and the mask on the Swamp Monster. Scary stuff...especially that Swamp Monster. Reminds me of my wife before her morning coffee. [Honey, if you're reading this...I've been hacked! Some hacker youth wrote that!]. 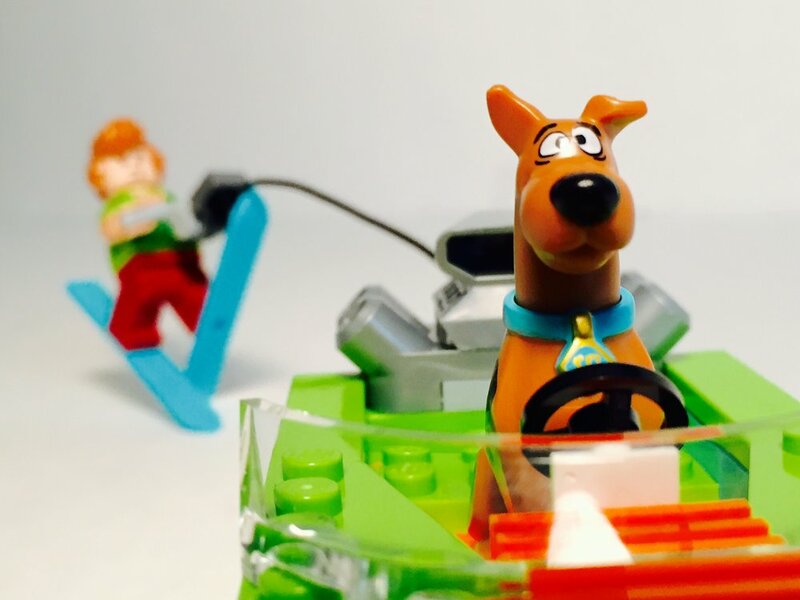 Whew...when it takes this many pictures and this many words to review a 400+ piece set, you know you've got a good set on your hands, and that is absolutely the case with the Scooby-Doo! Haunted Lighthouse. It checks all the boxes. 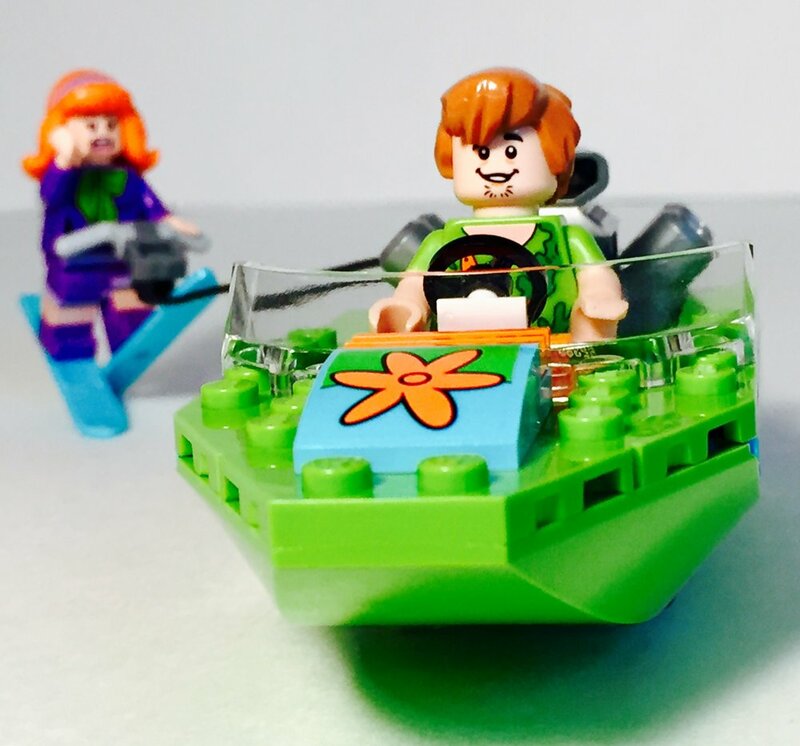 It's a great play set with tons of usable play features, it includes a zoomable speedboat to vehicle your minifigures around the room, it looks great displayed on a shelf as a display piece. As I mentioned up top, the Scooby-Doo! theme as a whole has really surprised me. I think it's one of the best designed themes LEGO has done in the recent past, and this is certainly a stand out set in that theme. If you're looking for a great set for your kids or interested in reliving some of the Scooby-Doo nostalgia, this set is must-have.